The bergenia produces large, heart-shaped leaves. Native to Asia, Afghanistan, Siberia and the Himalayas there are numerous varieties available. All bergenia plants display abundant evergreen leaves, a few varieties offer foliage rimmed in red and several varieties are valued for their metallic appearing leaves. The plants prefer shady conditions but the red leaved varieties benefit from partial sun because the sunlight aids in turning the foliage even rosier in appearance. The bergenia cordifolia is an excellent ground cover in shady locations. Pink flowers are produced on long 16-inch stems. The flowers make excellent cut flower when promptly placed in water. Foliage is a glossy green that normally measures 10 inches in length and 8 inches in width. The foliage of the plant offers wonderful wintertime interest because it turns a brilliant bronzed purple. The leaves are a favorite to clip and use in flower arrangements beside the cut flowers. The plant suffers from no serious diseases or insect infestations according to the Missouri Botanical Garden. The bergenia purpurascens produces distinct foliage that is green on top and a deep bronze red on the underside. During the fall, the entire leaf turns a dark red and often persists into winter. Flowers appear a dark purple. Clipping flowers after they die back will often extend the plants bloom time. The plant attains a height of 18 inches and thrives in full sun or partial shade. The spread reaches 25 inches per plant. Every few years in the fall or spring the plants will require dividing and transplanting. The bergenia crassifolia grows abundant green foliage that often appears cabbage-like. Each leaf measures approximately 6 inches in length. When the plant suffers drought the leaves will become outlined in red. Light lavender blossoms appear in the late winter or early spring when very few plants are flowering. Clip spent blossoms to encourage a longer bloom time. Spread of the plant is quite slow. 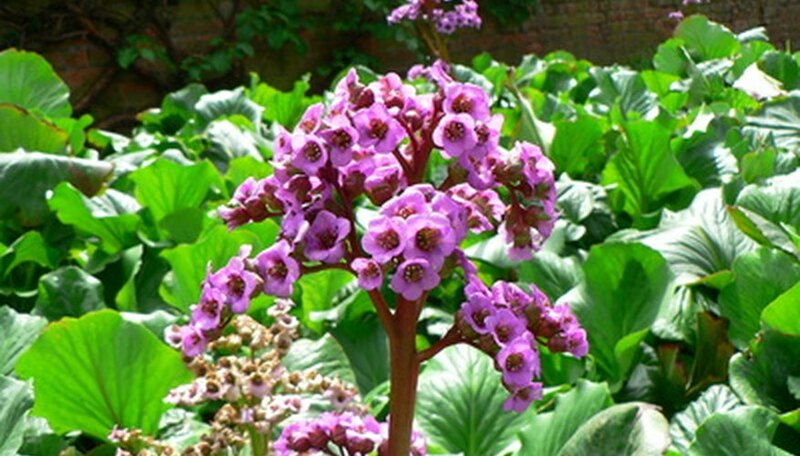 The bergenia crassifolia prefers to be planted in partial shade with moist soil that is abundant in organic matter.